We all carry around the technology to stay connected 24/7, yet many of us are disengaged and challenged with our lack of communication skills. 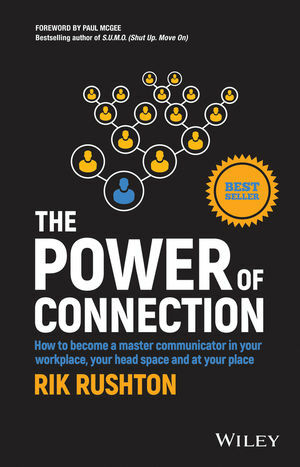 The Power of Connection provides you with practical, real-world solutions for improving your professional performance, your personal relationships and your outlook — one conversation at a time. Becoming a confident and compelling communicator might be the most important skill for leaders in the modern business landscape, parents in the modern home and individuals who use ‘self-talk' to help shape their world. By adopting the simple strategies revealed in every chapter, you can become an unshakeable success at what you set out to do. This book is designed to help you start communicating better today, so start reading and start practicing with your very next conversation! We are surrounded by noise, yet no one is actually saying anything we can connect with — or are we just not listening? Communication is a two-way street, and involves so much more than just speaking. The Power of Connection offers a quick and easy road map for your personal journey of growth and development that will make you a better parent, friend, spouse and employee. It's the right message for this time considering there's never a wrong time to level up your skills and become more effective at work, at home and in life. RIK RUSHTON is an international speaker, life coach and high-performance sports coach who works with individuals, corporations and multinational companies, sharing his success drivers with audiences across Australia and around the world.